"With the exception of Telltale Games and very few others, a guarantee that the game you just bought will never be finished and you should not get too attached to anyone." Live-Action TV is kind of like live action Film. Kinda. You have actors on a set, with specific characters, telling a story. You film it, you send it to post-production, and you jazz it up with special effects. When you're done, you have what appears to be real people in real situations acting unusual stories for your entertainment. And since it's recorded, you can watch it over and over again and it'll be the same every time, unlike Theater. But TV is different—the stories go on longer and are cheaper than movies (unless you buy massive TV box sets), but you only get to see a little of them every week. Eventually, someone in the Video Game industry looked at this model and said: "Huh. Well, if TV can do it... why can't we?" Episodic Games (or Episodic Gaming) is a relatively new take on a fairly old model in game production and distribution, pushed forward by digital download services. Episodic games are actually more like miniseries than TV shows, but the idea is similar. (PC shareware games during the late 80s and early 90s were all about episodic content, just not quite in the same way as modern episodic games.) Episodic games are short, cheap games (usually in the $5-$10 range), each of which tells part of the story. They take less time to develop due to their short length, so they can come out more frequently. They only tell part of a game story. However, due to their cost, if a player buys all the episodes, they still end up getting a full retail-priced game over a period of time. The idea behind releasing games episodically is fairly simple: By releasing more content over several months, gamers don't have to wait years for more new games. And by pricing them moderately, gamers can buy them and enjoy them steadily without having to put one massive-sized dent in their wallet. It doesn't always work out perfectly, of course. Companies can have financial troubles, developers can get carried away with designing the next installment, bugs happen, and all the usual stuff that stops games from being released on time. Because of the way it works, episodic gaming lends itself well to story-based games, such as Adventure Games. In particular, Telltale Games has historically made significant profit on episodic adventure games. 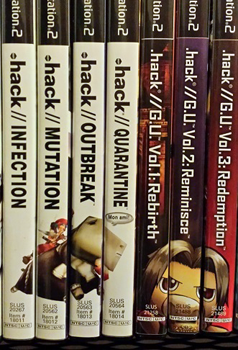 .hack, pictured above, is probably one of the modern day Trope Codifiers for this in terms of RPGs. Notable is that each sub series of games carried over all your stats, equipment, etc, to the next game. Alternate Reality was an ambitious mid-1980s sandbox RPG project. The first part — The City — was to serve as the hub and the rest 6 — The Dungeon, The Palace, The Wilderness, etc. — would expand it, but remain playable as standalones. Together they would form an unpreceedingly huge game world. Only 2 games were released: The City and The Dungeon. Due to buggy Copy Protection merging them resulted in player's death. Visiware's Arabian Nights was one of the first games to take advantage of digital distribution for this, with seven installments released one by one online in 2000-01 and then bundled together for a physical release. Aveyond 3, a shareware RPG that comes in three installments. Ball Revamped 3 consists of the two episodes Andromeda and Gemini. They're free flash games, and were split because the complete game exceeded the 5 MB limit on many game websites. Broken Age famously split the game into two sections in order to get more money to finish it. As a high profile Kickstarter project this caused some controversy. Byteria Saga: Heroine Iysayana, a freeware RPG. The three parts are now exclusively available as a bundle, but still distinct. Ciel nosurge is a simulation game, but vital backstory is told through downloadable episodes. Cutie Mark Crusade, a fanmade My Little Pony: Friendship Is Magic Point-and-Click Game by Manestream Games . The original version of Final Fantasy IV: The After Years. Final Fantasy VII Remake is confirmed to be this. The creators of the above mentioned .hack games, CyberConnect2, is confirmed to be part of the project. Half-Life 2's Episodes were an early attempt, which are more or less infamous for the fact that the gap between Episode Two and (the mythical) Episode Three is starting to get pretty damn large. Whenever Valve goes to a major expo like E3, forumites place bets on whether Episode Three will be announced or not. Hitman (2016) was released with two tutorial missions and the first story mission, with each story mission released monthly. Hiveswap and Hauntswitch, a pair of adventure games in the Homestuck universe. Hydrophobia was originally one but the first episode sold so poorly episode two never appeared. Instead it had an Updated Re-release to the PS3 and PC...then the company went bust so still no episode two. Joe Dever's Lone Wolf, The game is separated in four acts. King's Quest (2015) was originally released in this format, with the five chapters and bonus epilogue published and made available for purchase individually. Once the entire game had been published, it was made available on a single-purchase disc for consoles. Kiseki Series is one long continuous story, filled with plot twists and turns. It's also infamous for even just one game to take up at least 60-70 hours long only to either end in a personal victory at best for the heroes, a Bittersweet Ending, or a Wham Episode which then sets up the next game. Knee Deep was a low-budget TellTale-like adventure game, released over 2015. Its development was unusual in three ways: 1) It only had three episodes instead of the standard five; 2) The player didn't buy them separately but instead had to pay for the season pass at the start; 3) The first episode lacked voice acting, but it was patched in after the release of the subsequent episodes. The Last Door, is a micro-budget Point-and-Click adventure game with heavy use of pixel art. Currently finished its second season, with plans for a third. Learning with the Pooyoos, targeted at very young children. MARDEK, though Development Hell problems (rewriting the entire engine twice, among other things) caused chapter 3 to be over two years late, and the experience has exhausted the developer so much that he doesn't want to continue working on it for a while. Penny Arcade Adventures has had five episodes released. Notable in that a switch in both the studio and the genre had occurred midway through. Whereas the first two episodes had greater production values and were more real-time in nature, the financial considerations led to another studio using RPG Maker-style combat and aesthetics for the concluding three. Penumbra is a debut work of horror by the Frictional Games. The first episode, Overture, was generally praised as a promising start. The following one, Black Plague, is considered to build further build on Overture's strengths, and it also started some of Frictional's signature traditions, like not including combat (present in Overture). The final one, Requiem, is much shorter, had undergone a severe Genre Shift towards being a Puzzle Game and is generally considered skippable at best. Quest Fantasy, while not initially intended this way, fits with the shortness of each game. A Second Mario Bros. X Thingnote A game created by Let's Player raocow's community forum Talkhaus as an entry in the A Super Mario Thing series is split into multiple episodes, the first being called "Analog Funk". Future episodes are currently in development. King's Quest: The Silver Lining is a freeware 3D fan letter to the series that got through many legal troubles to exist in its current state. Cognition: An Erica Reed Thriller was developed by the same studio as The Silver Lining, but also involved Jane Jensen of Gabriel Knight. Its initial episode, The Hangman, released in 2012, and was originally planned to have five episodes, each named after the new killer introduced by said episode. Lacklustre sales forced them to reduce it to 4, though, and also to give up on the second season after finishing the first in 2013. Shadow Realms is intended to be episodic, with developers comparing episodes to sessions of the pen-and-paper RPGs from which the game takes inspiration. Shining Force III has the dubious distinction of being an incomplete episodic game outside of its native Japan; only the first episode of the three-part story was officially localized into English. SiN Episodes is an example of a failed attempt: only the first episode, Emergence, ever got released. Siren: Blood Curse was sold in three bundles of four chapters each on the PlayStation Network. Sonic the Hedgehog 3 is perhaps one of the earliest examples of this trope. Sonic 3 by itself has the first six Zones and Sonic & Knuckles has the last eight Zones. You can "Lock-On" both cartridges together and play one big combined game, Sonic 3 & Knuckles. This was originally not the plan with the game; the entire S3&K package was supposed to be released as simply one game, but time constraints forced Sega to split the game in half so they could get half of it onto store shelves and the other half done later. Sonic the Hedgehog 4: Episode I, Episode II, and Episode Metal. StarCraft II was not an episodic game when it was released, but rather Wings of Liberty as the base game and Heart of the Swarm as an expansion (Although if you had bought Heart of the Swarm, you'd also get Wings of Liberty), but when Legacy of the Void was released, the game was turned episodic, and each part of the trilogy can be bought and played standalone. Super Adventure Rockman is divided into three episodes on discs. Super Robot Wars occasionally does this. With the exception of Operation Extend, each episode is a separate physical product. Super Robot Wars Z3 has been confirmed to have two episodes. Warner Bros. did Flash Point And Click Adventure serials called Steppenwolf, which had six chapters with four episodes, as well as Arcane, which had two seasons, one with four episodes and the other with eight episodes. The Way (RPG Maker) has six consecutive episodes. Wing Commander Secret Ops, based on the VISION engine used in Prophecy. It's probably the Ur-Example, having come out in 1998. Winter Voices has seven episodes: the prologue, Avalanche - which also serves as Episode 1 - and six more episodes. With each "episode", the player travels closer to the capital of the kingdom, at first by foot, later barge, and finally by train. Sally Face is a five-episode point-and-click horror adventure game. The fourth episode was released November 30, 2018, leaving just one more at the time of this writing.